The first time I saw this Pontiac Tempest Sprint I had to do a double-take - it appeared as if the car had an overhead cam six-cylinder engine. Upon further inspection I found that it did, indeed. A straight six with an overhead cam in the 1960s. Who knew? The 1967 Pontiac Tempest with its original overhead cam six-cylinder "Sprint" engine. Apparently a lot of people even in the 1960s may not have known. Or maybe just didn’t care. In those days performance came from V8 engines even though Mercedes-Benz was winning races with a straight six that was remarkably similar to the one in this car. In fact, it was the inspiration for that engine. The overhead cam six-cylinder engine. But Pontiac’s division chief John DeLorean, the same guy who gave us the time-traveling stainless steel dud in the late 1970s, helped to persuade GM’s brass to add this unique power plant to the wide car division. GM’s decisions are often made more by the accountants than the car enthusiasts but the 1960s saw some interesting vehicles hitting the market from the then-market leading company. At the same time as this car hit the showrooms you could also buy Chevrolet’s rear-engine air-cooled Corvair and over at Oldsmobile the front-wheel-drive Toronado were also available for the few that wanted them. This was one of many interesting projects to nerds and gear heads at the time and, like most of the unique and advanced concepts, just didn’t sit right with the mainstream market. Nope, cheap, large V8s were the standard then. And considering you could buy the V8 Tempest for less money, why would you buy the six? Well, there are many who say the six-cylinder Tempest, particularly with the Sprint engine package, is a much more balanced car. And the 215 horsepower could give your friends with some V8s a good run for their money while also convincing your insurance company that you’re just all about thrifty transportation. Plus some folks would give innovation a nod and this family bought this particular Tempest in 1967 rather than a GTO or any of the other cars they could have had. Our original owner found that this followed Pontiac’s mandate that nobody had to adjust the valves so the division created a really unique solution where the cam sat almost on top of the valves, but used finger-type cam followers - like rocker arms - each of which was pivoted on a small hydraulic sphere that functioned like a lifter. Brilliant. Anyone who had memorized GM’s parts catalog of the day would recognize parts from Chevrolet’s similar in-line six at the time, though Pontiac’s block was different. They might also recognize the valves from Pontiac’s V8s as well. But the sum of this engine might have been greater than just the parts bin. The 230 cubic inch six was available in the Tempest and LeMans and you could opt for the “Sprint” version as was fitted to this car which featured high-compression pistons, a hotter cam, dual value springs, dual exhaust, stronger coil and the then-new Quadrajet four-barrel carburetor. All these fun bits added up to 215 horsepower, a big jump from the 165 horsepower of the base engine and no slouch compared to some contemporary V8s but in a lighter, thriftier package. There were a number of other innovations as well for this engine. For example, rather than operate the overhead cam with either gears or a chain, both of which were quite noisy in their function, Pontiac partnered with Firestone and created a fiberglass-reinforced, neoprene-impregnated nylon fabric belt which proved to be strong and durable. In fact, in high-mileage testing it withstood the punishment and was said to last the reasonable life of the engine. Of course, in those days, it wasn’t uncommon to do major engine work around 100,000 miles. 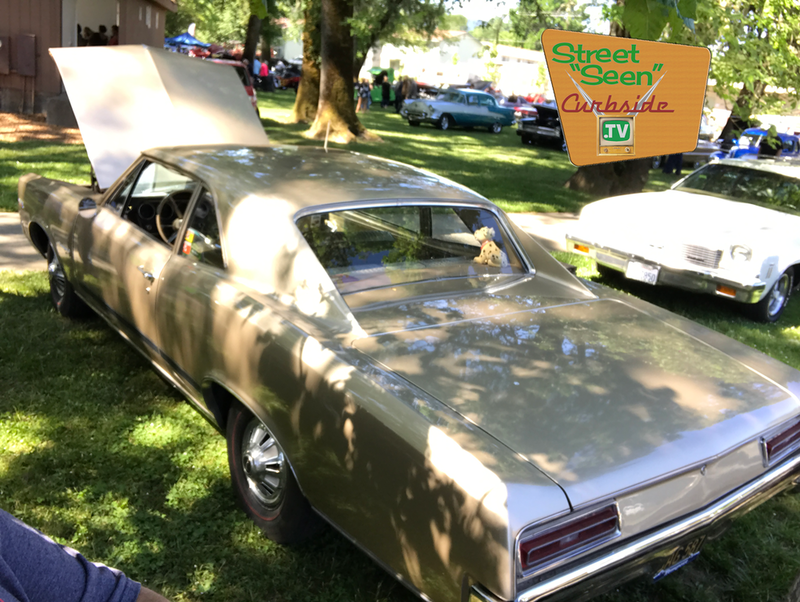 The family that owns this car today are the same people who took it home from the dealership in 1967 and it is in good hands with several other very unique collectible cars. They’ve had great taste for half a century at least. Pontiac continued to make this engine through 1969 but displacement jumped in '68. Also in the showrooms in ’67 was the then-new Firebird and that car, too, could be equipped with the same engine. In fact, if you can find a relatively unmolested Pontiac Firebird with the six-cylinder “Sprint” motor that’s in this car you’ve got yourself one genuine collectors favorite. While the larger V8-powered cars are pretty valuable, these none-too-common six-cylinder vehicles are quite the find. The 1960s were really a great time for GM. It had market leadership and also offered a variety of cars for all tastes - whether you wanted big, monster boats; small, cutting-edge sporty cars or something in between. With this mid-sized Tempest and it’s high-performance six-cylinder overhead-camshaft engine it truly is something in between and, as Goldilocks can tell you, that position can be just right!